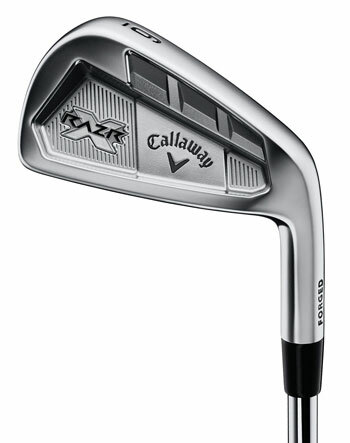 To see the latest Callaway iron sets, please visit our Callaway irons page. Buy RAZR X Irons Now! 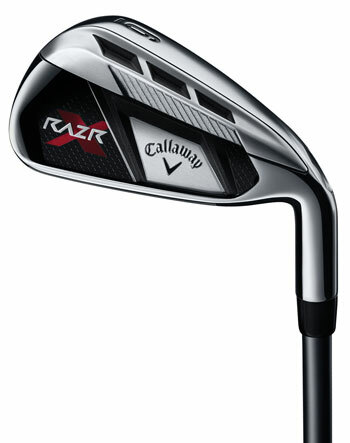 The Callaway RAZR X is Callaway's game-improvement club, replacing the X-22 and X-24. For starters, the new irons feature Callaway's variable face thickness technology, making the hitting area on the face thinner the further you move away from the center. The result is a bigger sweet spot giving you more control and consistent ball speed on off-center hits. But the really cool feature of these new irons is what Callaway has done with the weighting. In our analysis of the new Cleveland drivers, we noted the important distinction of shaving vs. redistributing clubhead weight. In Callaway's RAZR X Irons, the weight moved off the face and a few other non-critical areas has been redistributed into a waffle patterned weight on the rear of the club. This location allows it to be separate from the sole so it does not interfere with the club's interaction with the turf. The weight is also invisible at address, which is a great feature of this club. RAZR X Irons feature a lower, deeper center of gravity and a consistently hot face. In head-to-head tests, Callaway says the RAZR X Irons are 56% more accurate than competing irons that chase distance at the cost of accuracy. VFT Power System - A refined VFT Face and High-Definition Undercut cavity are tailored to each individual iron. The result is more consistent ball speeds across the face for more distance and accuracy, even on miss-hits. For an oversized iron, the Callaway RAZR X is actually nicely sized and has a confidence inspiring top line that does not have the thickness of some game improvement irons. The offset is also less noticeable and a little slicker, making these irons a nice aesthetic match for the mid-handicapper. Buy RAZR X Forged Irons Now! What sets the RAZR X Forged Irons apart is the unique Triple Net Forging process. This three-step forging yields superior feel and enables high-performance Tour CC grooves to be precision forged into each club face. The Forged Irons also feature the waffle pattern on the rear of the clubhead, but it's only aesthetic, as the weighting system in the RAZR X (and also in the Tour version) is not part of the RAZR X Forged iron. Tour CC Grooves provide golfers with increased spin for aggressive shot-making and a proprietary design producing 40% more grooves on the club face. Forged 1020 Carbon Steel produces soft feel and responsive feedback at impact. Triple Net Forging ensures tight tolerances that can't be achieved with conventional methods, and allows Callaway engineers to incorporate higher-performing grooves that still conform to Tour rules. The RAZR X Forged Irons have a narrow sole and a slick, thin topline that gives this club a classic look at address. Additionally, it has a higher, squared-off toe and a sharp leading edge. 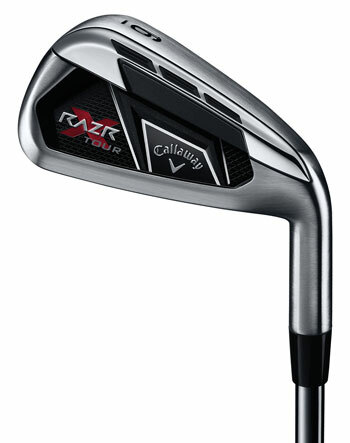 Buy RAZR X Tour Irons Now! The new RAZR X Tour Irons are designed for low-to-mid handicap players looking for a next-generation combination of playability and workability. The RAZR Technology aims to provide balance between distance, accuracy and feel, with Tour-inspired styling. It's longer and more accurate than its predecessor, and according to Callaway, resulting in the equivalent of hitting it four feet closer to the hole. Not too shabby. Winner of a Golf Digest 2011 Hot List Gold Medal in the Players Iron Category. The RAZR X Tour Irons also feature a 23% lower CG and 18% deeper face as well as the VFT Face and High Def Undercut cavity tailored to each iron. These irons have a smaller profile with less offset and a thinner topline for a sleeker look at address, offering the workability and control without sacrificing confidence at address. One of the biggest differences in the new RAZR X line of clubs comes in the game improvement area. We noted above that the RAZR X Irons do not have that super-clunky, thick look at address that we associate with these types of clubs. That fat look is good for players who struggle to make consistent contact, but it becomes distracting once you've graduated to a more controlled style of golf. These clubs offer the same distance and forgiveness without the overwhelming size difference at address. That makes RAZR X a good long-term investment for a beginner, as well as a nice fit for many mid-handicappers who want the look and feel of workability and control.